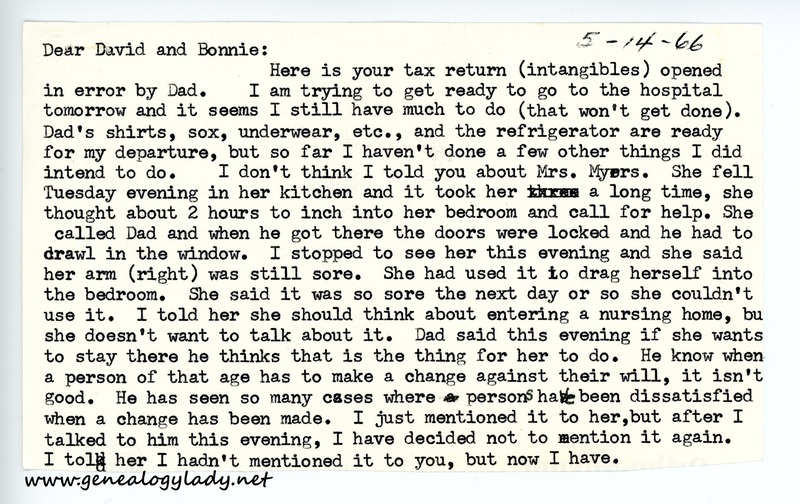 Here is your tax return (intangibles) opened in error by Dad. I am trying to get ready to go to the hospital tomorrow and it seems I still have much to do (that won’t get done). Dad’s shirts, sox, underwear, etc., and the refrigerator are ready for my departure, but so far I haven’t done a few other things I did intend to do. I don’t think I told you about Mrs. Myers. She fell Tuesday evening in her kitchen and it took her a long time, she thought about 2 hours to inch into her bedroom and call for help. She called Dad and when he got there the doors were locked and he had to crawl in the window. I stopped to see her this evening and she said her arm (right) was still sore. She had used it to drag herself into the bedroom. She said it was so sore the next day or so she couldn’t use it. I told her she should think about entering a nursing home, but she doesn’t want to talk about it. Dad said this evening if she wants to stay there he thinks that is the thing for her to do. He knows when a person of that age has to make a change against their will, it isn’t good. He has seen so many cases where persons have been dissatisfied when a change has been made. I just mentioned it to her, but after I talked to him this evening, I have decided not to mention it again. I told her I hadn’t mentioned it to you, but now I have. [page 2] Your letter received today. I agree with you, but how can the powers that be, be made to see what seems to plain to us? It seems strange that after all the changes Morse has gone through, that we would agree with him now, but he does seem to make sense. However, I rather think he is not going to be listened to. I have so much to do, I think it would be better for me to try and get some of those things taken care of I have been trying to get done today, so I won’t have so much to look forward to (unhappily) when I come home. What are you going to do with your furniture? 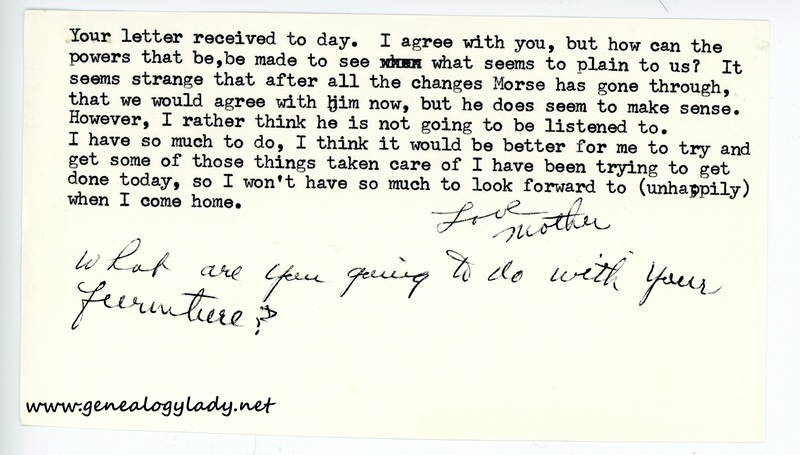 This entry was posted in Genealogy, Yegerlehner and tagged 1960s, Boston, Boston University School of Theology, David A. Yegerlehner, genealogy, Gladys R. (Foster) Yegerlehner, Indiana, Kentland, Massachusetts, Roscoe S. Yegerlehner, Ruth M. Myers on March 27, 2017 by Deborah Sweeney. What an ordeal she describes. Wow. “He knows when a person of that age has to make a change against their will, it isn’t good.” Good point, actually. ” What are you going to do with your furniture?” Not quite sure what this means.